As you know, RJ loves sensory things. Sand, mixing his salts, beads, etc. Such things fulfill a sensory need for him. But there was one thing I forgot. The very thing he’s using to make his sachet bags. Rice. He loves kneading rice – it’s like a stress ball for him. Originally, I was going to have him add some essential oils to the bags – thinking for fragrance purposes only. But then my brain finally kicked in and wa-la!!! We’ll leave them unscented for individuals to add their own essential oils–their own aroma therapy!!! Ah, what a concept, hey? Here’s my thought in why I am having RJ leave them unscented. As I said, rice can be quite a wonderful tool for sensory needs. It’s used in sensory bins and for making weighted blankets. It can help ground an individual that is having a bit of stim overload. Secondly, essential oils are becoming quite popular for a number of reasons. I’ve spoken with many parents that use oils to help calm, balance, and ground their disabled loved ones. I know, I know…I’m rambling. But I was just so excited this weekend at Maple Fest when talking to parents and teachers, even adults that have stressful jobs. We all need a sensory “fix” now and then. So – while the rice provides a textile “fix”, the essential oils provide the aroma therapy. If you add a small amount…four or five drops are plenty…to the rice and mix it in…you’ve got a portable aromatherapy tool. With the bonus of a natural stress ball!! I’ll use RJ as an example here. I add a calming or grounding essential oil to the rice. The fragrance will last well over a week before needing some refreshing with a few more drops. I could leave the rice in the plastic bag, but he gets more fulfillment if it’s loose in the organza bag. And it smells pleasant, anyways. So – say we’re shopping and RJ starts becoming anxious about something. I pull the organza bag out from my purse, hand it to him. He can play with the bag, and perhaps hold it closer to his face to get the full benefit of the oil. Same thing in the car. If he’s getting stressed about sirens, I can just hand him the bag. It’s a traveling sensory emergency kit! Granted, it might not be a complete master of meltdowns, but it sure does help. And not only for disabled individuals. How many of you feel relaxed after aroma therapy with Lavender? Or a similar oil? How many of you enjoy playing with a stress ball? 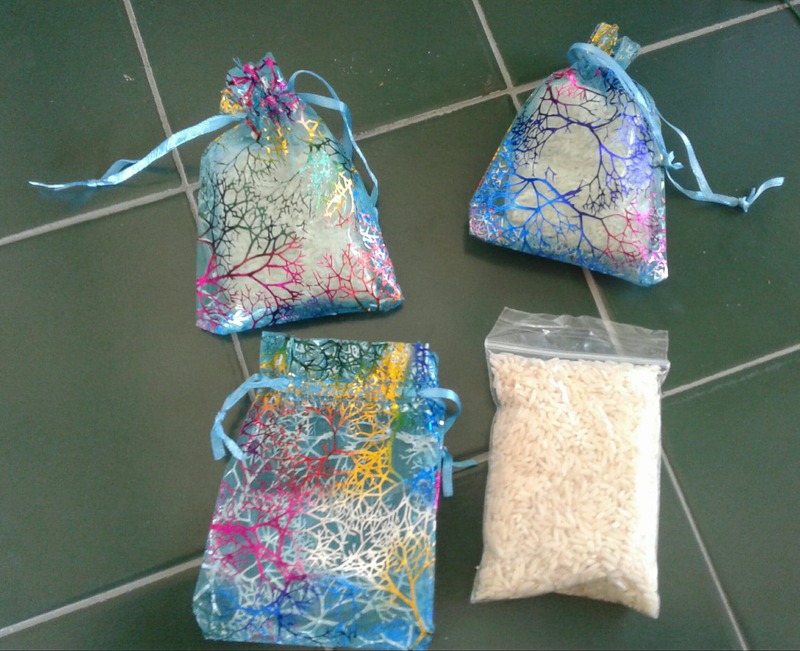 To use these little bags, remove the rice from the plastic bag and put several drops of essential oil in it. Stir it up a bit. Then place the rice in the organza bag. The material of the organza bags we have is nice and thin for the oil fragrance to work, and thin enough to get a “stress ball” effect. The colors are attractive also. So – that’s it! **It’s important to note if your child puts things in their mouths, watch them closely so they don’t eat the rice!! If you are nervous about that happening, try poking a few holes in the plastic bag so the aroma is noticeable. Always take care your child doesn’t try to eat the rice!!! ** When the fragrance starts to fade, add a few more drops to freshen it up for future use. I had a ton of positive feedback this weekend from parents, teachers, and others that use essential oils. So I’ve decided to have RJ make his sachet bags unscented. I hope they’ll be of some benefit to you!